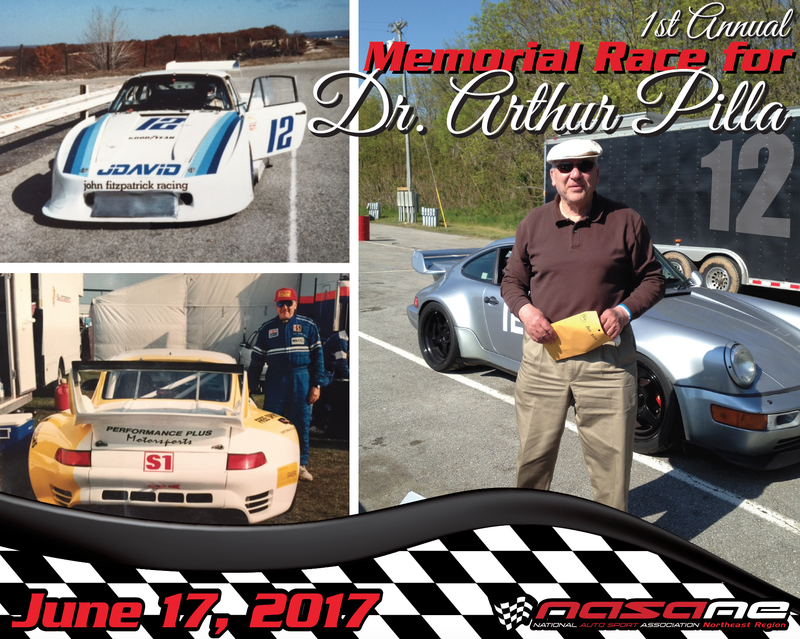 Join us for the First Annual Memorial Race in honor of Dr. Arthur Pilla sponsored by the National Auto Sport Association Northeast Region on Saturday June 17, 2017! NASAne has generously offered to host this yearly event in memory of Dr. Pilla and in support of the Arthur Pilla Research Foundation created by his family in his honor. Dr. Pilla has had a long-standing relationship with NASAne, and in fact the relationship first began with the Z Club of America back in the early 80’s. Joe Casella, currently Regional Director of NASAne, and Art remained friends through the Z Club of America, and then later through its transition to the Performance Driver’s Association (PDA). Art was also on hand to see the transition of the PDA to the NASAne franchise. Always willing to jump into a car to help instruct, especially into 911’s due to his long-standing racing experience with 911 turbos, Art will be sorely missed here at NASAne. Art was also a long-time member of the Porsche Club of America, Northern New Jersey Region (NNJR- PCA). Dr. Pilla had a few unfinished ideas and projects both in the laboratory and on the racetrack at the moment of his passing in October 2015. One of these projects was to build a race car from a salvaged 1971 911 RSR body that he had recently found. Dr. Pilla’s family decided to complete the car in his honor, and it’s inaugural unveiling will be during the weekend of the NASAne June 16-18, 2017 race/HPDE weekend at New Jersey Motorsports Park on the Thunderbolt track. It will also be acting as the official pace car for Saturday’s Race with Dr. Pilla’s daughter and grandson as driver and passenger. Please stop by all weekend to take your photo with the #12 car! NASAne will be hosting a raffle on Saturday June 18th with all proceeds going directly to the Arthur Pilla Research Foundation. You’ll have a chance to win a Free Track Day hosted by NASAne and other cool prizes! Raffle winners will be drawn at the awards ceremony on Saturday. Please consider donating in support of young scientists around the world. Saturday’s raffle is not the only opportunity to help support the Arthur Pilla Research Foundation. You can donate directly and read all about the Foundation at ArthurPilla.com Your donation directly helps fund the Annual Arthur Pilla Young Scientist Award in support of young Ph.D. scientists in the field of electrotherapeutics and is awarded yearly at the annual meeting between the Bioelectromagnetics Society and the European Bioelectromagnetics Association, this year taking place in China! Many of you will remember Dr. Pilla’s enthusiastic personality and his ever-willingness to lend a hand with boundless energy. This was the case both in his profession and at the racetrack. Throughout his lifetime, he has helped countless patients with little hope in healing a hard- to – heal broken bone using pulsed electro-magnetic fields. He has helped patients in pain suffer less and take far less prescription pain medicine than normally taken after surgery. In fact some of you may even have one of his coils to this day. On behalf of NASAne and the Arthur Pilla Research Foundation, thank you for helping us honor this great man who will be sorely missed both in the racing community and in the world of scientific research in electrotherapeutics. Please visit this page to leave your tribute to Dr. Arthur Pilla if you knew him from his racing days. Please visit this page to leave your tribute to Dr. Arthur Pilla if you knew him from his scientific research days. The Memorial Race takes place on Saturday, June 17, 2017 at New Jersey Motorsports Park in Millville, NJ. Address: 8000 Dividing Creek Road, Millville, NJ 08332. Race time will be posted here as soon as it becomes available. I’d like to attend the Memorial Race but I am not signed up for the event- can I still attend? Yes! Guests are welcome! Simply drive to the main gate and say you are with NASA. You will need to sign an NJMP waiver at the front gate, then proceed to the THUNDERBOLT racetrack. Once parked, come to the NASA REGISTRATION desk and sign the secondary NASA waiver to get a WRISTBAND. No, it’s free to come out on race day! We hope that you will buy a raffle ticket instead to support the Arthur Pilla Research Foundation. I’ve never experienced racing before. Any chance I can experience what it’s all about? Yes! Sign up for Hyperdrive! For $50 you can experience 20 minutes of track driving with a certified instructor. ** Must bring your own car! Can be any type of car. Further Questions? Feel free to contact us!